Now that I am well into my 2nd trimester (and nearing my 3rd, oh my!) 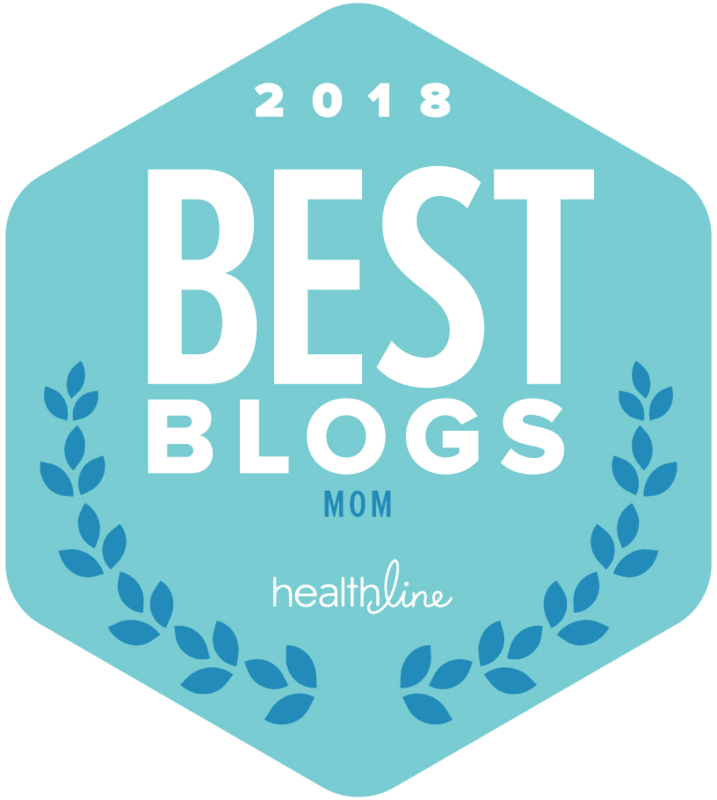 I feel that I am in some sort of position to share what I have dubbed my “pregnancy must-haves.” Sure, this list will be a bit different for every woman, but I think the gist is the same for all. The most important thing in pregnancy is to be good to your body — after all, it is doing some amazing things here! Your body is growing a little human being! Take that in for a second. Now, don’t you think it deserves some love in return? I thought so. 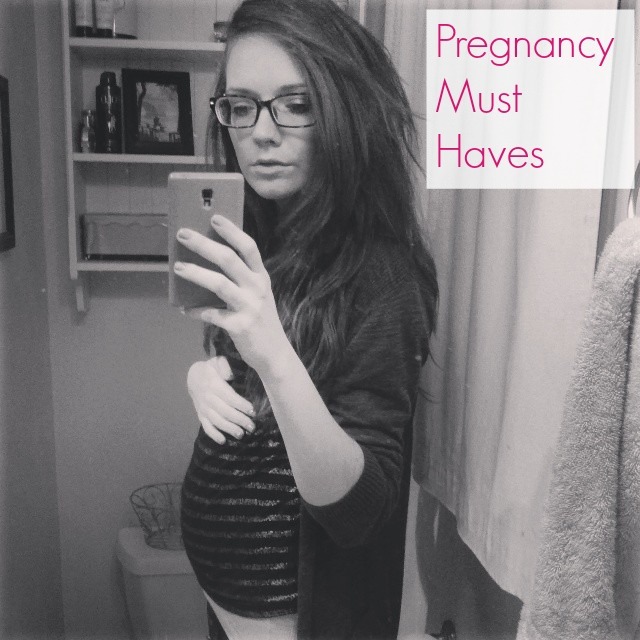 Without further ado, let’s get into a general guideline for the ultimate pregnancy must haves. There are numerous “stretch mark creams” out there that claim to keep your body free of those battle scars, if you will, but really? I hate to break it to you, but the major cause of stretch marks is genetics, which no amount of miracle cream can change. But, it doesn’t hurt to try, right? Enter, coconut oil. It’s nourishing, smells delicious (seriously, it’s a tropical paradise inside that bottle!) and it has some great skin benefits! Coconut oil isn’t just for slathering all over your skin, either. You can cook with it, use it as a hair mask, and even eat it straight! This stuff is just plain amazing. I did my research on pre-natal vitamins even before I found out I was pregnant, and started taking them long before, because really, they are the perfect multi-vitamin for women — pregnant or not. They make your hair and nails fantastic, and they have everything you need in a vitamin! Plus, the gummy ones taste like candy! Bonus! One of the joys of pregnancy is a change in your skin — mostly for the worst. You may find yourself breaking out more than a pre-pubescent teenage boy. It happens. So make sure to take extra good care of your skin by sticking to a gentle routine, including a great face wash and exfoliator. I have been literally living in my leggings throughout my pregnancy. It is inevitable — those jeans of yours are just going to stop fitting after a while. And yes, the good old hair tie trick is great in the beginning, but when even that doesn’t work, you’re left with just wanting to be comfortable. Enter maternity leggings. They are incredibly comfortable and very forgiving in the waist. I guarantee, you will never want to go back after trying these out. Life changer. It’s nice to still feel fancy even when you aren’t allowed to partake in the real bubbly, and sparkling water has been my saving grace in this department. Go ahead, squeeze some lime juice in there and pour it into a champagne flute. Now we’re talking. My biggest craving this pregnancy has been — wait for it — WATER. Yes, that’s right. I just seem to be thirsty all of the time. Which is actually fantastic, since staying hydrated is very important, especially whilst making a baby! One great way to make sure you keep yourself nice and hydrated is to fill up a water bottle and have it with you, always. Savvy tip: A good rule of thumb with water intake is to make sure to drink at least half of your body weight, in ounces. Ohhh the joys of sleeping while pregnant. It can be a challenge, that’s for sure. One major thing that helps in a huge way is to get yourself a good body pillow. Since you are advised to sleep on your side (not your back!) while pregnant, the pillow helps get you extra comfortable, even if your position may look crazy to anyone else. If it feels right, go with it. There will be plenty of sleepless nights ahead, once baby comes! Another joy of pregnancy is indigestion and constipation. There, I said it. So make sure to have some Tums handy, at all times. You just never know when you’ll need them. This book is the most popular and well-known pregnancy book for a reason. It is chock-full of tips and tricks and contains all you need to know during pregnancy. It is broken up into each month and is extremely useful and full of great information! This is literally the pregnancy bible. Now go on with your pregnant self and make sure to indulge whenever possible! You are beautiful and deserve to feel that way. 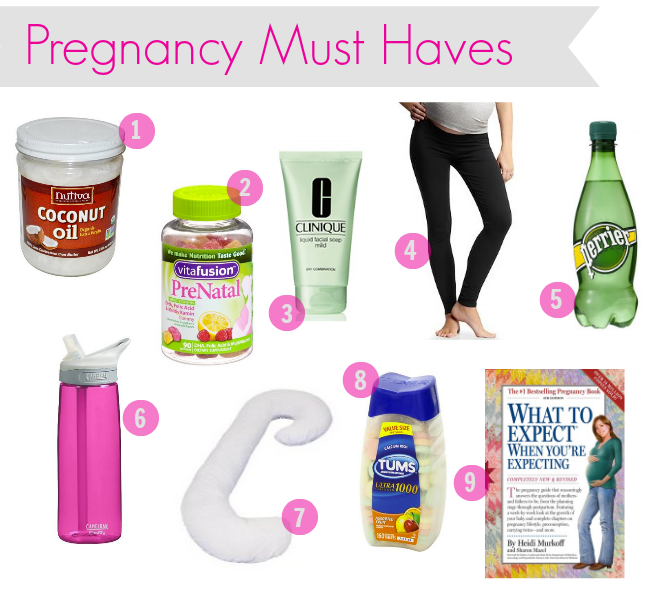 These pregnancy must haves should definitely help. What do you think? If you are pregnant or are a mama already, what are your pregnancy must-haves? Share in the comments below! My pregnancy must-haves were a great prenatal yoga class (not technically a “thing” but it was a must-have!) for all of those aches and pains and to prepare myself for labor, my Hypnobabies relaxation CD and like you, coconut oil! Couldn’t have lived without it!